"TONY & MIKE'S EXCELLENT ADVENTURE"
story told of an adventure, with a little amount of mortality thrown in. 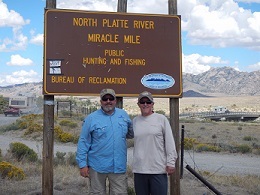 Two guys, Tony Pettit & Mike Ballard, with fly rods, chase Cold Water Sunsets west in a Land Rover Discovery, pulling a drift boat for 5,200 miles. They float the White River, the Green River, The Gray Reef, The Madison River, The Missouri River and the Big Horn River. Also they fly fish Alluvial Falls in the Rockies for green back cutthroat, the Yampa river, the Miracle Mile, and Slough Creek in Yellowstone for gullible trout.